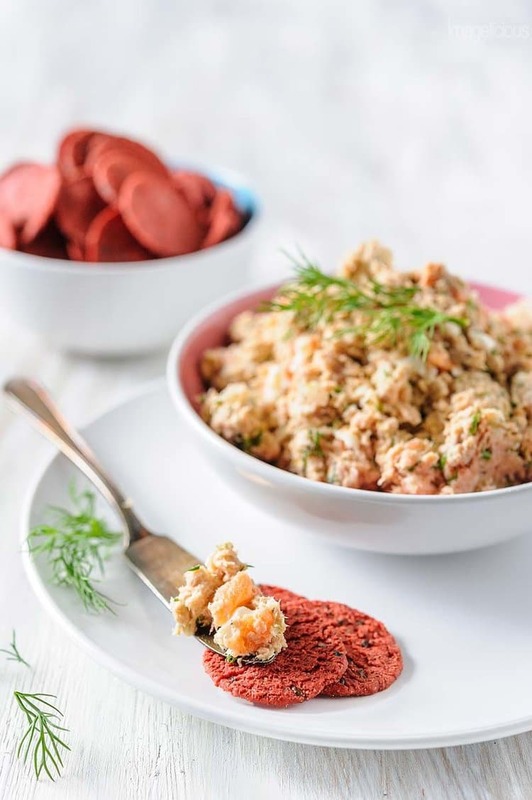 Affordable Canned and Smoked Salmon Rillettes is delicious, elegant and easy to prepare. Perfect to serve as an appetizer for a fancy dinner or family brunch. After breakfast and desserts appetizers are my favourite. Maybe it’s a Russian thing as we always had a table full of various salads, hor d’oeuvres and snacks before the main course. Russian fancy dinners were always long and fun with food and drink and more food. Main course would usually be a couple of hours into the dinner when everyone was full on deli meats, pâtés, cheeses, pickles, salads and many more appetizers. First time my husband went to a Russian restaurant to celebrate my friend’s birthday he ate for a couple of hours and once he got full he ate some more. Then they brought more food. He was surprised. He never saw that much food brought in after that much food. That dinner was six courses. Most people are full after the first – appetizer course. Appetizers are my favourite! I love nibbling on olives and cheese and stuffed anything. I love spreading food on other food. I love dipping various breads and crackers and veggies into even more food. It’s fun. It’s delicious. And it’s not boring. I love smoked salmon and I use it often when I host dinners or brunches but I am always aware that it’s not the most affordable ingredient. So, I like creating appetizers that pack the flavour and punch of smoked salmon but are not crazy expensive, like my Smoked Salmon and Dill Mini Pancakes for example. 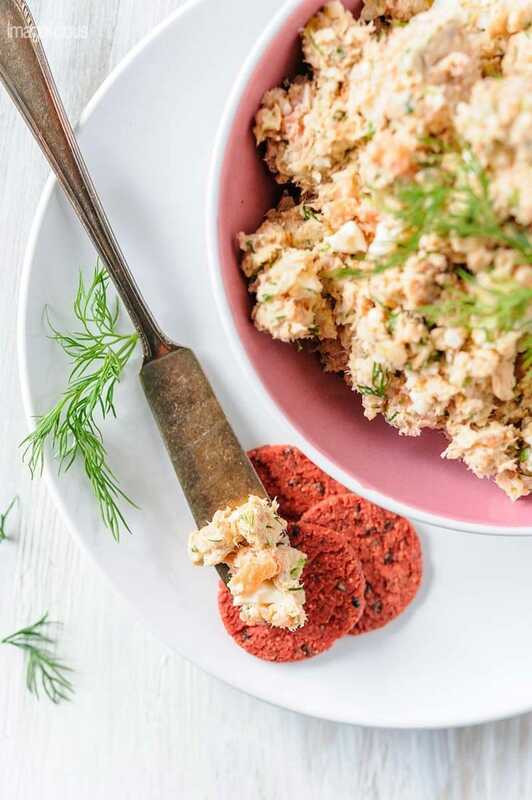 This recipe for Salmon Rillettes is great for serving at any elegant dinner party yet it’s also affordable as it uses canned salmon and only a small amount of smoked salmon. I discovered Rillettes a few years ago and I’ve been making them for holiday entertaining since then. In short, Rillettes is a course pâté and it can be made from pork, chicken, or, as in this case, salmon. 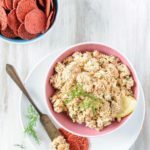 This Canned and Smoked Salmon Rillettes is not only affordable but also very quick to make as salmon doesn’t need to be cooked. It’s delicious and great to serve for an intimate Valentine’s Day dinner or an elegant Oscars Viewing Party with a glass of bubbly or white wine. 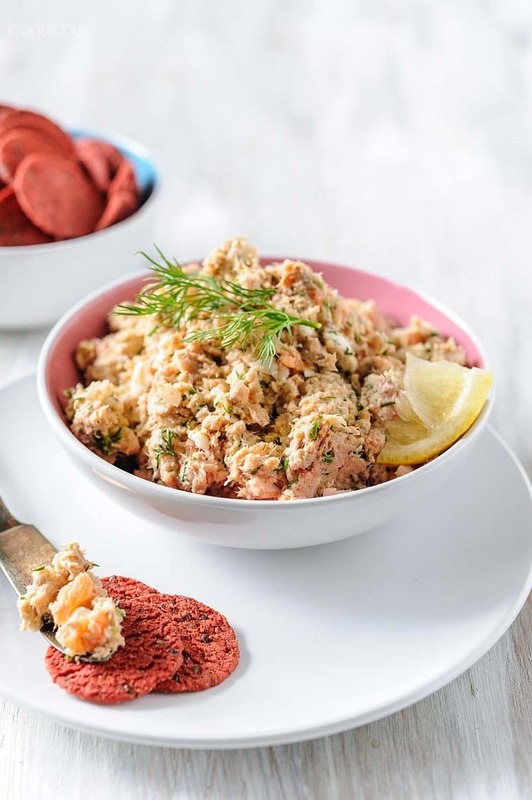 To make Canned and Smoked Salmon Rillettes you don’t need any fancy equipment, not even a food processor – just a knife and a chopping board to dice smoked salmon and a bowl and a fork to mix everything together. 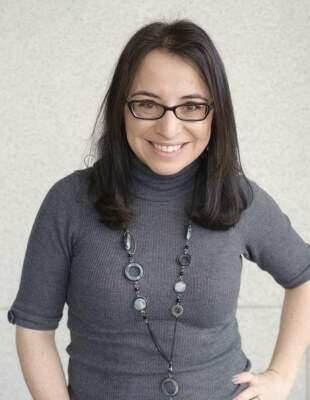 So, chop, dice, mix. Enjoy!! And the best thing about this recipe, besides it being delicious and affordable, is that it needs to be made in advance and stay in the fridge overnight to develop the flavours, thus making it ideal to serve at a party. Dice onion very finely and place in a small bowl, pour boiling water over the onion and let stand for one minute, then drain. This makes the onion sweeter, but if you are using sweet or spanish onion then you can omit the boiling water step. Drain canned salmon and discard any skin or bones. Note, if you have cats then cats would love the drained salmon water. 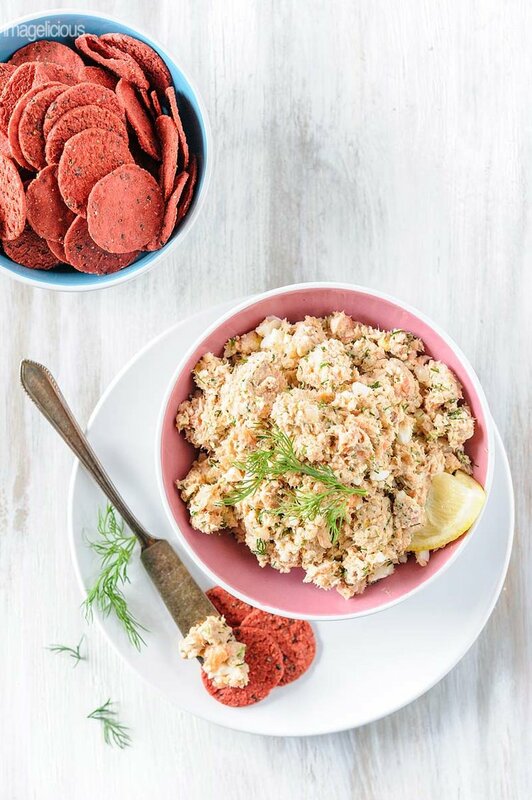 In a large bowl mix together all the ingredients mashing the canned salmon and egg until a course pâté forms. Place rillettes into a bowl, cover with plastic wrap and leave in the fridge overnight. I love Smoked Salmon but here it’s so expensive that we eat it like gold. I often make Tuna and frozen fish cakes when I can. This looks so delicious.. 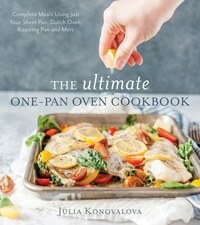 I will try make this soon – I’m very it will be a big hit in our home. I love smoked salmon! My family lived in Washington state for a little while and we would travel up to the Lummi Indian reservation to buy their cold smoked salmon – it was the best!! Definiltey worth the drive to get it. I’ve found some similar salmon at Whole Foods, but we can only get there a couple times a year from where we live. That would be phenomenal in this recipe! ALL the food is a European thing. When I first started dating my husband, and brought him to my Ukrainian family functions, he was amazed at ALL the food. To me it was the norm. At the One of a Kind Show…you can get some really good smoked salmon in a can from BC. We have bought it by the case…and it is the only smoked salmon I will eat. This sounds like the perfect recipe to try with a can or two.